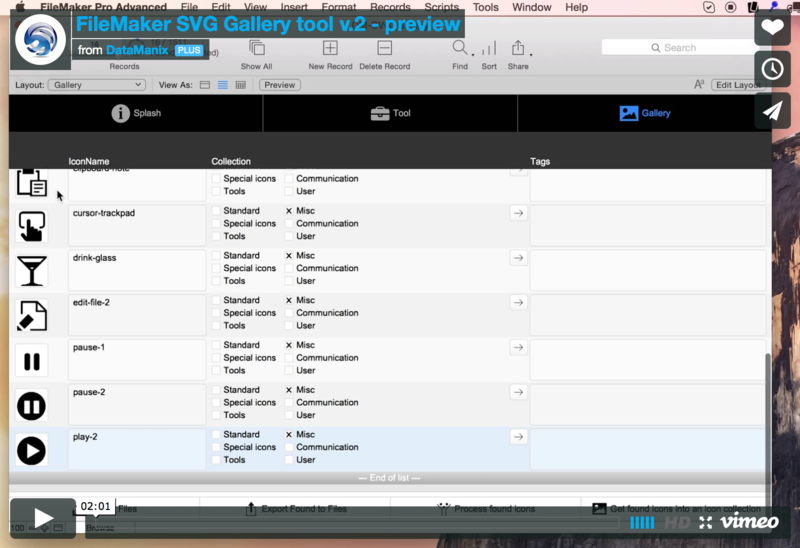 Now you get an even smarter way of managing your SVG icons, and a very smart and easy way to get a collection of icons, directly into the icons palette within your FileMaker solution. The SVG Gallery tool works by importing your icons, taking the content of SVG files directly into a text field. From there, you can process all found icons to add the needed class in order to allow FileMaker 14 to control the color of the icon. Now, in order to get a collection of icons into the icon palette in your solution, there is now a very smart way to do so, using the SVG Gallery tool. Simply find the icons, you want in the gallery, do an optionally sorting, press a button and the function will now generate a buttonbar object, containing a segment for each of the found icons, with an icon on each. This buttonbar will be placed on the clipboard. Now you just go to your solution and paste that buttonbar object. You can delete it again immediately after you have pasted it, as FileMaker will already have copied all the icons into the icon palette of that solution file. Here is the video we did with Richard Carlton from www.learningfilemaker.com. Short video will explain what the SVG format is about and how to use this tool. If you want to get your hands on this tool and want to learn more about it, let me know and follow @DataManix at twitter, linkedin or facebook for announcements. Please provide your name and email address for your free* download. Distributed as-is; no warranty is given.Use of the material is at your own responsibility. If you use techniques from our solutions, you are welcome to credit DataManix (optional of course). Your information stays with us! The idea behind TheBrainBasket is to share. Here you can find news, links and other stuff - all related to FileMaker® and the community. We hope you enjoy! This FileMaker blog is created by DataManix – a FileMaker FBA Platinum partner, located in Denmark. We do custom development for all kinds of businesses. In case you are interested in our services, please click to check our website.